Syrian troops fired machine guns on a border town in northern Lebanon, but Beirut denied reports that Assad’s crossed the border. Syrian troops fired machine guns on a border town in northern Lebanon, but Beirut denied reports that Assad’s crossed the border. Reuters reported that Syrian soldiers invaded Lebanon. One report stated that nearly three dozen Syrian troops destroyed a farm building in Lebanon and fought rebels who had fled there. One resident reported that soldiers crossed the border in armored personnel carriers. Heavy gunfire was heard Tuesday morning, according to the Beirut Daily Star. No casualties were reported at the village of Al-Joura in Masharih al-Qaa, which has served as a passage for Syrian soldiers and civilians trying to escape the carnage in Syria. At least six more people were killed Tuesday morning in a suburb of Damascus and in Homs, one of the strongest areas of opposition to the regime that it says has killed more than 10,000 people. 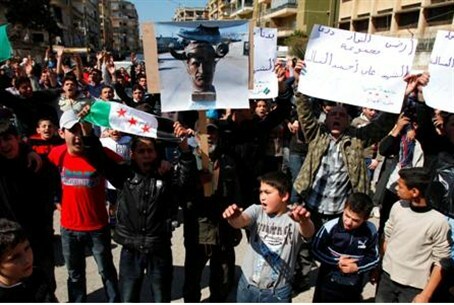 Assad reportedly visited Homs morning in a sign that his soldiers have successfully suppressed rebel forces. The Beirut newspaper reported that Syrian President Bashar Assad has accepted Kofi Anan’s plan to end the violence, but Assad previously has verbally accepted several proposals without executing them.